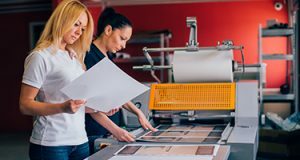 Let your printed materials stand out from others in the mail by printing your brochures and postcards over-sized. While it may seem like almost all marketing strategies have turned to digital, direct mail remains an important marketing strategy for businesses across many different industries in 2018. Whether you utilize direct mail as a strategy for mailing coupons, promotional items, or informative brochures, there are many different ways to get creative with your direct mail pieces before sending them out to your target audience. If you are currently in the process of redesigning your direct mail pieces for 2018, consider these four easy direct mail design tips to make your printed materials stand out from the competition. Let your printed materials stand out from others in the mail by printing your brochures and postcards over-sized. This will not only make your direct mail pieces loud and eye-catching for your target audience, but it will also provide you with a larger canvas for your creative content and information about your promotions. Not only will colorful direct mail pieces be visually appealing, but they will also help to communicate a message for your brand. Choose the colors for your creative content wisely before you send out your direct mail pieces, keeping in mind that certain colors will represent your brand in a specific way. Because printed materials are tangible resources for your target audience, fun and unique folds in the paper of your direct mail pieces are a great way to provide an interesting and positive interaction with your brand. This is another easy way to make your direct mail pieces stand out from the rest, as recipients of your printed materials will remember the unique style of your brand. Creative visuals, such as colorful graphics, are essential for capturing the attention of your target audience with a direct mail piece. Once your visual elements have done their job, strong writing is crucial for clearly communicating a call to action to your target audience in order to drive both online traffic to your website and foot traffic to your store. Humor, relevant content, and eye-catching graphic design are perfect for drawing in your audience to engage with your content. This entry was posted on Friday, May 25th, 2018 at 10:00 am. Both comments and pings are currently closed.